Birding Is Fun! 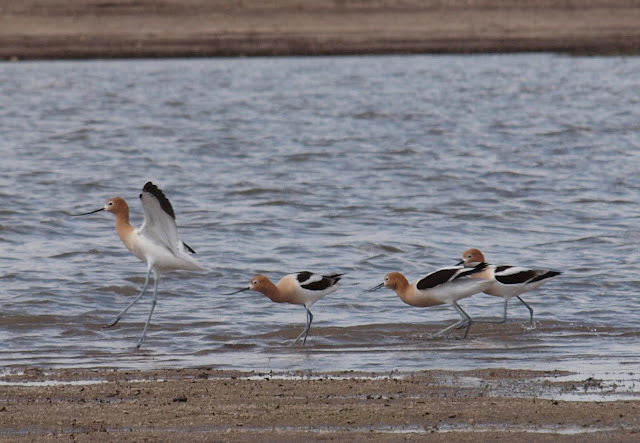 : American Avocet beauties! I've loved American Avocets since the first time I saw them at Malheur NWR in Oregon in my first year of birding. I thought I saw a lot then, but that was nothing compared to what I've been seeing during spring and fall migration along Utah's Antelope Island Causeway. Avocets numbing in the thousands!!! This time of year, the Avocets mostly lack the rust colored heads and necks that make them especially stunning in the Spring. But there's nothing wrong with monochromatic beauties either! Range maps for your American Avocet edification are shown below. The American Avocet is mostly a western North America species, but populations are regular along the southern coast. Vagrancy in the east appears to be fairly common and probably a very exciting species to see for many when they appear. Avocets are beautiful, agreed. Like the Stilts, they seem to talk that fine line between grace and utter fragility, which is always amazing to find in the natural world. Our mom says it's like a woodstock concert! I LOVE avocets! I got to see my first ones at the beach in September. I love just about any Recurvirostrid (Ok I also like saying and writing "Recurvirostrid"). Beautiful pictures, please keep up the great blog posts. I love Avocets. Saw my first one ever in Utah.